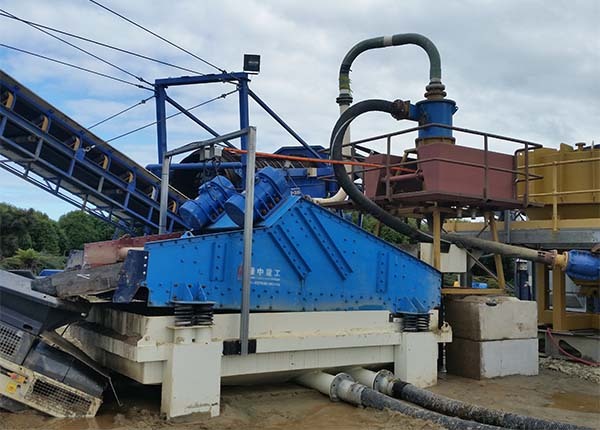 Dewatering screen for sale Australia is actually a specific dehydration, desliming, sculting, washing, fines recycling high frequency vibration screen. It can be widely used for washing sand, sand and gravel plant, washing coal slurry, coal slurry recovery, coal washing plant, and is also commonly used in mines, all metal ores, etc. 1. Can be used together with sand washing machine in wet sand production line, and can also be used alone. 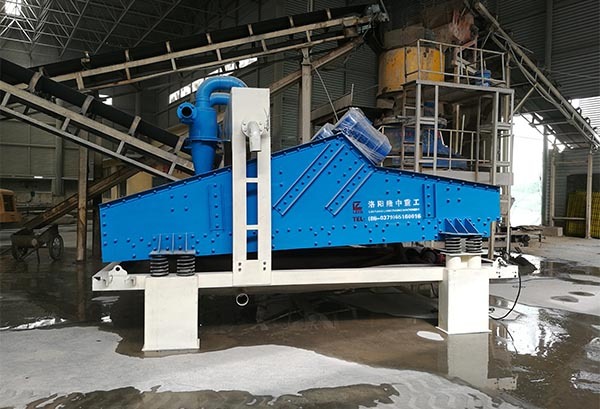 The washed sand and gravel are cleaned by sand washer, then dewatered by dewatering sieve to remove mud and recover fine sand to achieve a reasonable particle size ratio, and the mud content is reduced to less than 0.7%. 2. Special equipment for desilting, sculting and dewatering fines recovery in coal washing plant, such as coal slurry recovery with a particle size of <9mm, pressure filtration coarse separation, filtration separation. 3. Used for tailings dry discharge, concentrate dewatering and other operations. It can process fine-grain grade minerals, used for automatic separation of slag and water, tailings dry discharge technology, etc. Can also be used together with cyclone as a tailings dry discharge recovery machine, and the dewatering efficiency is higher. 4. As the screening device for environmentally friendly waste materials. Suitable for high-frequency, high-vibration strength material, with the advantages of large processing capacity, good dehydration effect. 1. When the two motors rotate synchronously in opposite directions, the vibration force generated by the eccentric block cancels in the direction of parallel motor axis, and is combined in the direction of the vertical motor shaft, so the movement track of the sieve machine is a straight line. 2. The two shafts have an inclination angle with respect to the screen surface in the vertical direction. Under the combined action of vibration force and material self-gravity, the material on screen surface moves forward along the continuous jump. 3. During the encounter with screen surface, the material and water smaller than the mesh hole are penetrated through the screen surface to achieve dehydration, de-sludge and classification. 4. The polyurethane screen panel of dewatering screen is upwardly oriented in the horizontal direction, and the rear part of screen is at a 45-degree angle with the main board. 5. Two balanced vibrating motors are mounted horizontally, the unbalanced gravity produces a turning effect when rotating, ensuring stable operation of the dewatering screen and minimizing noise reduction. 6. The screen is embedded for easy installation and partial replacement.